Shopping for DC Comics Cases? What a great place to store your 8-inch figures! Keep your DC Retro Action Figures organized! Perfect for carrying your favorite Mego-style figures. Case features a cool design with images of retro DC characters. Don't let your retro action figures get all messed up from just lying about! 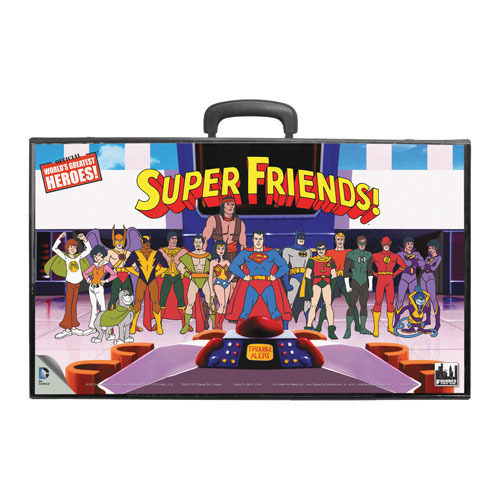 This awesome Super Friends Retro Action Figures Carry Case measures about 22-inches wide x 13-inches tall and includes spaces for 12 unpackaged figures and accessories. It's perfect for storing and carrying your 8-inch Batman Retro Action Figures or other Mego-style figures. It also features a cool design with images of many of your favorite characters! Ages 13 and up.